It’s time to go back to school! Stitch school! This week, Anna Nikipirowicz teaches us how to cable. When you mention cable knitting most people imagine gorgeous braids, ropes, crosses and twists, and a lots of knitters, especially new ones, are scared to try cables because they look far too complex. I urge you to just try it and you will see that it is deceptively simple and really quite an easy technique to master. Cables are created by transferring a number of stitches to a cable needle and knitting them in a different sequence. Cables are sometimes referred to as Aran stitches, named after the Aran Islands off the west coast of Ireland, where the techniques are thought to have originated. Cables are worked on the right side, and are usually worked in stocking stitch on a background of garter stitch, reverse stocking stitch or moss stitch, to allow the cables to stand out. In the example below the cable stitches are worked over 8 stitches, but can be made over any even number of stitches (for example, 4-stitch, 6-stitch or 10-stitch cables). You divide the stitches into two groups, for example a cable of 4 stitches will have 2 stitches in each group, first group of 2 stitches will be moved onto a cable needle and held at the back or front of work, and then you knit the 2 stitches from the left-hand needle and finally the 2 from the cable needle. I will shortly take you step by step and show you the techniques that create cables, but first let’s talk about tools needed and instructions. 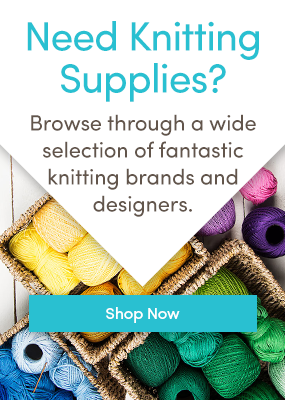 You will need some yarn, knitting needles suitable for your yarn and a cable needle. Cable needles are a short needles with two points like a double-pointed needle. They can be straight or cranked like the one in the picture below. The cranked needle makes it almost impossible for the stitches to slip off while you work on the next stitches, which is very helpful. They usually come in a pack of 2 or 3 sizes, it is best to use the one closes to the size of your knitting needles, it does not have to be exact, but if the cable needle is too small the stitches may slide off when you are working on your cable and if it is too thick the stitches will stretch. Very often cable patterns are charted, as it gives a visual representation of what the cable will look like when it’s knitted up, and it is also quite a compact way of showing instructions for a large and complicated design. Each cable has a symbol and they do vary widely. Always, check the symbol key for detailed instructions on how to work the cable in each design. For our swatch I have written and charted the instructions so you can familiarise yourself with both. Our chart is for a flat work so it reads from right to left on the right side and left to right on the wrong side. This is a chart for a simple right and left cable, each worked over 8 stitches. Our cables are in stocking stitch on a background of garter stitch. The first cable starts on row 5 which is a right side row. Cables will rarely start on the first or second row as they produce a very twisted edge. Let’s start by casting on 28 stitches. Row 2: knit 4, purl 8, knit 4, purl 8, knit 4. Rows 3 & 4: as rows 1 and 2. As you can see our pattern is forming, it is easy to see now the stocking stitch which will house our cable and the garter stitch on each side. Coming in front of the cable needle, knit 4 stitches from the left hand needle, now knit the 4 stitches from the cable needle to complete the cable 8 back. C8F – cable 8 front. Slip the first 4 stitches from the left hand needle onto cable needle and leave it at the front of work. Going behind the cable needle, knit 4 stitches from the left hand needle, now knit the 4 stitches from the cable needle to complete the cable 8 front. If we look at our work now you can see how the stitches are slanting, exactly as shown on the chart. We now have to work a few rows in pattern in between our cables otherwise the work will twist too much if we work the cables too close to each other. Try following the chart to see how you get on, if not just work rows 1 and 2 for 5 rows. Tip: If you find that the first stitch knitted after the cable needle is a little baggy, try knitting into back of it to tighten. A nice distance has been work from last cable. Work row 11 and you can see a lot better how the pattern emerges. Continue working from chart repeating rows 1 to 12 until your work has the desired length. Why not try this lovely honeycomb pattern which uses C4B and C4F cables and is worked entirely in stocking stitch! Row 3: k1, *C4B, C4F, rep from * to last st, k 1. Rows 5 and 6: as rows 1 and 2. Row 7: k1, *C4F, C4B, rep from * to last st, k1. Stay tuned to the LoveKnitting blog for more Stitch School posts! You’re right, I’ve been wanting to learn cable knitting but thought it would take me too long to figure it out. Your instructions look doable even for a ” scaredy cat” like me. Will print this and try it this week.